The Bachelorette star Becca Kufrin is already picturing what her wedding day is going to look like when she marries Garrett Yrigoyen. Beeca and Garrett visited Atlantic City to host The Pool After Dark at Harrah's Resort on Saturday, and while there Becca discussed the couple's future plans during an interview with Go To Whitney reporter Whitney Ullman (watch the interview below). When asked what her dream wedding will entail, Becca explained, "I've always pictured it being at a vineyard, just because I love wine and they are so beautiful. So I think we've talked about maybe doing it on a vineyard, maybe in California." 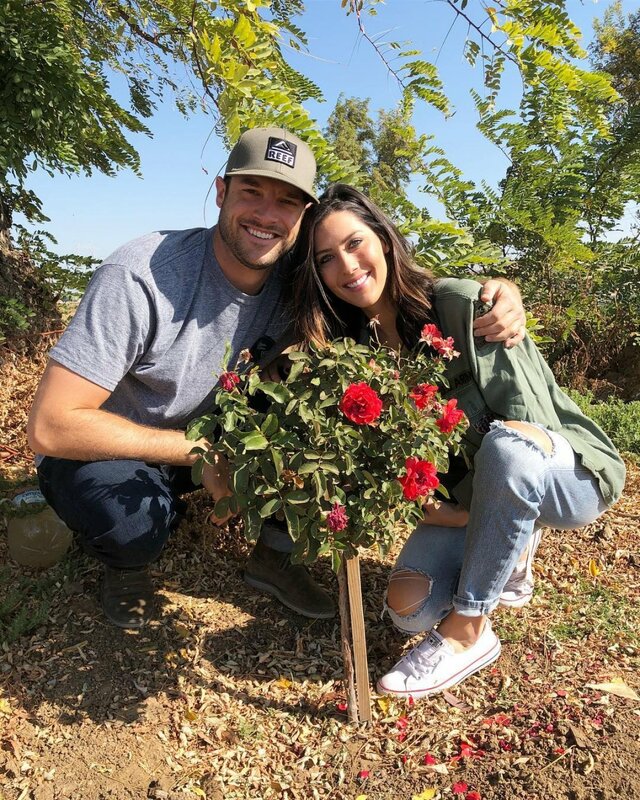 Becca and Garrett got engaged at the conclusion of The Bachelorette's fourteenth season in early August after rejecting her devastated runner-up, Blake Horstmann. But before falling in love with Garrett, Becca got engaged to Arie Luyendyk Jr. on The Bachelor's 22nd season. Becca may have left that experience with a broken heart once Arie determined he wanted his runner-up, Lauren Burnham, back, but she still left the show with a group of new friends she'll have for the rest of her life. "I would love a lot of girls from my season [at my wedding]. I'm so close with [Caroline Lunny] and [Tia Booth] and [Chelsea Roy] and [Bekah Martinez] and [Kendall Long], so I'd love to have those girls there -- because they knew me since the beginning of this. So to have them and even some of the guys from my season, like, Garrett is still close with some of the guys," Becca revealed. "We still stay in touch with some of them and they've been so supportive and great and fun to catch up with." Ever since Becca and Garrett went public with their relationship, they have apparently been traveling together nonstop, making appearances and also enjoying time with their friends and family. During Becca's interview with Go To Whitney, she also talked about the couple's goals and potential new projects. "We've been traveling a ton. We're literally living out of a suitcase right now, so the next fun thing is Garrett's brother is getting married, so we head down near San Diego for that, and then just spending some more time in Minnesota," Becca said. "I really want to settle down and figure out where we're going to put down roots and then I have all of these crazy ideas. I want to write a book, I want to start a robe and slippers line -- all of this fun stuff. So we just have to sit down and really start planning it out." According to prior interviews, Becca and Garrett will probably choose between Minnesota, Los Angeles or Garrett's hometown of Reno, NV, as the place where they will settle down.